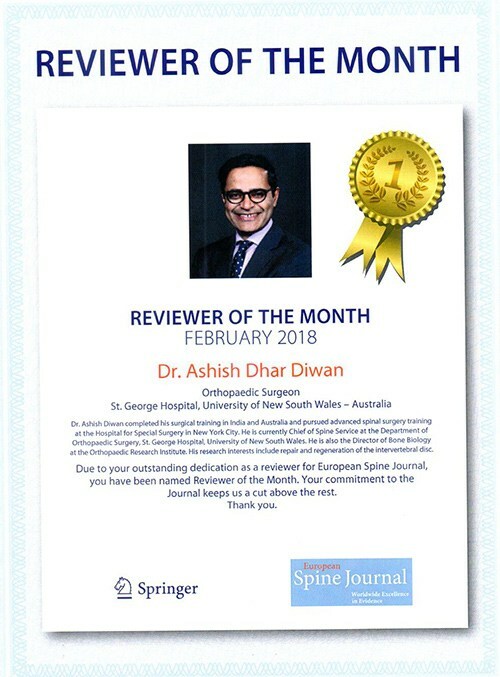 Dr Ashish Diwan (MBBS, MS, MNAMS, PhD, FRACS, FAOrthA) is the Director of Spine Service at the Department of Orthopaedic Surgery, St. George Hospital, University of New South Wales. He is also the Director of Bone Biology at the Orthopaedic Research Institute. Within the University of New South Wales, he also functions as the Post Graduate Coordinator for the St George & Sutherland Clinical School. His University profile can be accessed here and his current H-index and citations can be accessed here. Following his orthopaedic surgical training, he received training in advanced spinal surgery at the Hospital for Special Surgery (HSS) in New York City, which is the largest Orthopaedic Hospital in the US and is always ranked No 1 in the world for musculoskeletal problems. Dr Diwan was awarded the prestigious Philip D. Wilson Award at the Hospital for Special Surgery (HSS) New York. He is now an International Ambassador for HSS. 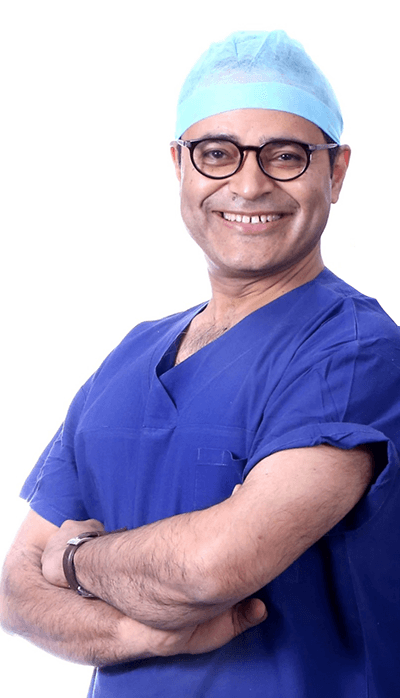 Dr Diwan has mentored and tutored numerous spinal surgeons over the years. He was part of the global Trainers Team for prodisc lumbar and cervical prostheses and he currently teaches rebalancing of the spine using minimally invasive posterior spinal fusions and minimally invasive lateral access surgery to the spine. He has also developed novel approaches to decompressing the spine where the stability of the spinal column is maintained. His current treatment development passions include bio-surgical approaches to regenerating the spinal disc and developing a nucleus replacement device for patients who are undergoing microdiscectomy, where the current approach is to discard the sequestered disc material. He is a recipient of the National Orthopaedic Surgery Fellows Foundation Award for outstanding achievements in the field of Orthopaedic Surgery. He was awarded the Merrill Lynch Global Innovation Award 2000. 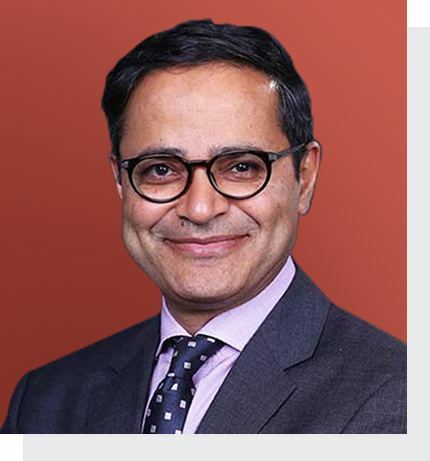 He is the Treasurer for the International Society for the Study of Lumbar Spine, a Delegate for AO Spine Asia Pacific, Director Asia Pacific for Society for Lateral Access Surgery, the Section Editor for International Journal for Spinal Surgery, Deputy Editor for the Asian Spine Journal. In the past, he has served on the Research Committee of the International Society for the Advancement of Spinal Surgery, and has been the Vice President of OTC-South Pacific, Topic Co-Chair (Spine) for Orthopaedic Research Society, Honorary Associate Professor in the Faculty of Engineering and IT of the University of Sydney and Guest Editor of Orthopaedic Clinics of North America on two occasions. Sabnis AB, Chamoli U, Diwan AD. Is L5-S1 motion segment different from the rest? A radiographic kinematic assessment of 72 patients with chronic low back pain. Eur Spine J. 2017 Nov 27. doi: 10.1007/s00586-017-5400-4. Viglione LL, Chamoli U, Diwan AD. Is Stand-Alone Anterior Lumbar Interbody Fusion a Safe and Efficacious Treatment for Isthmic Spondylolisthesis of L5-S1? Global Spine J. 2017 Sep;7(6):587-595. doi: 10.1177/2192568217699210. Epub 2017 Jun 1. Virk SS, Diwan A, Phillips FM, Sandhu H, Khan SN. What is the Rate of Revision Discectomies After Primary Discectomy on a National Scale? Clin Orthop Relat Res. 2017 Nov;475(11):2752-2762. doi: 10.1007/s11999-017-5467-6. Epub 2017 Aug 28. Wei A, Shen B, Williams LA, Bhargav D, Yan F, Chong BH and Diwan AD. Expression and functional roles of estrogen receptor GPR30 in human intervertebral disc. The Journal of Steroid Biochemistry and Molecular Biology. 2016; Jan 23. DOI: 10.1016/j.jsbmb.2016.01.012. Wei A, Shen B, Williams LA, Bhargav D, Gulati T, Fang Z, Pathmanandavel S and Diwan AD. Expression of growth differentiation factor 6 in the human developing fetal spine retreats from vertebral ossifying regions and is restricted to cartilaginous tissues. J Orthop Res 2016, 34(2):279-289. Zhou FY, Wei A, Shen B, Williams LA and Diwan AD. Cartilage Derived Morphogenetic Protein-2 Induces Cell Migration and Its Chondrogenic Potential in C28/I2 Cells. International Journal of Spine Surgery. 2015; Oct 22, 9:52, DOI: 10.14444/2052. Gulati T, Chung SA, Wei A and Diwan AD. Localization of bone morphogenetic protein 13 in human intervertebral disc and its molecular and functional effects in vitro in 3D culture. J Orthop Res. 2015; 33(12):1769-75. Williams LA, Wei A, Bhargav D, and Diwan AD. Cartilage derived morphogenetic protein 2 - A potential therapy for intervertebral disc regeneration? Biologicals. 2014; 42: 65-73. Wei A, Shen B, Williams L, and Diwan A. Mesenchymal stem cells: potential application in intervertebral disc regeneration. Translational Paediatrics. 2014; 3: 71-90. Sabnis AB and Diwan AD. The timing of surgery in lumbar disc prolapse: A systematic review. Indian J Orthop. 2014; 48: 127-135. Diwan AD, Leong A, Appleyard R, Bhargav D, Fang ZM, and Wei A. Bone morphogenetic protein-7 accelerates fracture healing in osteoporotic rats. Indian J Orthop. 2013; 47: 540-6. Oliver RA, Yu Y, Yee G, Low AK, Diwan AD, and Walsh WR. Poor histological healing of a femoral fracture following 12 months of oestrogen deficiency in rats. Osteoporosis Int. 2013; 24: 2581-9. Arora M, Chan EK, Gupta S, and Diwan AD. Polymethylmethacrylate bone cements and additives: A review of the literature. World J Orthop. 2013; 4: 67-74. Arora M, Diwan AD, and Harris IA. Burnout in orthopaedic surgeons: a review. ANZ J Surg. 2013; 83: 512-5. Grigg M, Arora M, and Diwan AD. Australian medical students and their choice of surgery as a career: a review. ANZ J Surg. 2013. Grigg M and Diwan AD. The painful back; elements of current understanding. . Karnataka Medical Journal. 2013; 46: 3-6. Arora M, Asha S, Chinnappa J, and Diwan AD. Burnout in emergency medicine physicians. Emerg Med Australasia. 2013; 25: 491-495. Chamoli U, Diwan AD, and Tsafnat N. Pedicle screw-based posterior dynamic stabilizers for degenerative spine: In vitro biomechanical testing and clinical outcomes. J Biomed Mater Res A. 2013. Zhou F, Wei A, and Diwan A. An overview of intervertebral disc degeneration and evaluation of the chondrogenic and chemotactic potential of CDMP-2. Journal of Biomimetics, Biomaterials & Tissue Engineering. 2013; 13: 97-118. Mathew J, Singh S, Garis S, and Diwan A. Backing up the stories: The psychological and social cost of low back pain. Int J Spine Surgery. 2013; 7: 29-38. Kishen TJ, Lindstrom ST, Etherington G, and Diwan AD. Veillonella spondylodiscitis in a healthy 76-year-old lady. Eur Spine J. 2012; 21 Suppl 4: 413-7. Mitchell SJ, Hilmer SN, Kirkpatrick CM, Hansen RD, Williamson DA, Singh NA, Finnegan TP, Allen BJ, Diamond TH, Diwan AD, Lloyd BD, Smith EU, and Fiatarone Singh MA. Estimation of lean body weight in older women with hip fracture. J Nutr Health Aging. 2012; 16: 188-92. Kishen TJ and Diwan AD. Should doctors learn to teach? Natl Med J India. 2011; 24: 246-7. Sabet T, Ho R, Choi J, Boughton P, and Diwan A. A kangaroo spine lumbar motion segment model: Biomechanical analysis of a novel in-situ curing nucleus replacement device. Journal of Biomimetics, Biomaterials, and Tissue Engineering. 2011; 9: 25-35. Shen B, Wei A, Whittaker S, Williams LA, Tao H, Ma DD, and Diwan AD. The role of BMP-7 in chondrogenic and osteogenic differentiation of human bone marrow multipotent mesenchymal stromal cells in vitro. J Cell Biochem. 2010; 109: 406-16. Brisby H, Wei AQ, Molloy T, Chung SA, Murrell GA, and Diwan AD. The effect of running exercise on intervertebral disc extracellular matrix production in a rat model. Spine (Phila Pa 1976). 2010; 35: 1429-36. Wei A, Leong A, Williams L, Chung S, Shen B, Bhargav D, and Diwan AD. BMP-7 in combination with estrogen enhances bone formation in a fracture callus explant culture. Tohoku J Exp Med. 2010; 221: 61-8. Shen B, Wei A, Bhargav D, Kishen T, and Diwan AD. Hyaluronan: Its Potential Application in Intervertebral Disc Regeneration. Orthopedic Research and Reviews. 2010; 2: 17-26. Kishen TJ, Mohapatra B, Diwan AD, and Etherington G. Post-traumatic thoracic scoliosis with rib head dislocation and intrusion into the spinal canal: a case report and review of literature. Eur Spine J. 2010; 19 Suppl 2: S183-6. Kishen TJ and Diwan AD. Fusion versus disk replacement for degenerative conditions of the lumbar and cervical spine: quid est testimonium? Orthop Clin North Am. 2010; 41: 167-81. Strange DG, Fisher ST, Boughton PC, Kishen TJ, and Diwan AD. Restoration of compressive loading properties of lumbar discs with a nucleus implant-a finite element analysis study. Spine J. 2010; 10: 602-9. Mohapatra B, Kishen T, and Diwan AD. Multiple lumbar pedicle fractures in osteopetrosis: a case report. Spine (Phila Pa 1976). 2010; 35: E311-5. Diwan AD, Khan SN, Cammisa FP, Jr., Sandhu HS, and Lane JM. Nitric oxide modulates recombinant human bone morphogenetic protein-2-induced corticocancellous autograft incorporation: a study in rat intertransverse fusion. Eur Spine J. 2010; 19: 931-9. Wei A, Chung SA, Tao H, Brisby H, Lin Z, Shen B, Ma DD, and Diwan AD. Differentiation of Rodent Bone Marrow Mesenchymal Stem Cells into Intervertebral Disc-Like Cells Following Co-Culture with Rat Disc Tissue. Tissue Eng Part A. 2009; 15: 2581-95. Wei A, Tao H, Chung SA, Brisby H, Ma DD, and Diwan AD. The fate of transplanted xenogeneic bone marrow-derived stem cells in rat intervertebral discs. J Orthop Res. 2009; 27: 374-9. Shen B, Bhargav D, Wei A, Williams LA, Tao H, Ma DD, and Diwan AD. BMP-13 emerges as a potential inhibitor of bone formation. Int J Biol Sci. 2009; 5: 192-200. Wei A, Williams LA, Bhargav D, Shen B, Kishen T, Duffy N, and Diwan AD. BMP13 prevents the effects of annular injury in an ovine model. Int J Biol Sci. 2009; 5: 388-96. Wei A, Chung SA, Tao H, Brisby H, Lin Z, Shen B, Ma DD, and Diwan AD. Differentiation of rodent bone marrow mesenchymal stem cells into intervertebral disc-like cells following coculture with rat disc tissue. Tissue Eng Part A. 2009; 15: 2581-95. Shen B, Wei A, Tao H, Diwan AD, and Ma DD. BMP-2 enhances TGF-beta3-mediated chondrogenic differentiation of human bone marrow multipotent mesenchymal stromal cells in alginate bead culture. Tissue Eng Part A. 2009; 15: 1311-20. Clarke R, Fang Z, Diwan A, and Gilbert D, Tourette Syndrome and Klippel-Feil anomaly in a child with chromosome 22q11 Duplication. Case Reports in Medicine Vol. Article ID 361518. 2009. Kishen T, Etherington G, and Diwan A. Cranial subdural haematoma with concomitant spinal epidural and spinal subarachnoid haematomas: a case report. J Orthop Surg (Hong Kong). 2009; 17: 358-60. Kishen TJ, Harris IA, and Diwan AD. Primum non nocere and randomised placebo-controlled surgical trials: a dilemma? ANZ J Surg. 2009; 79: 508-9. Lok P, Boughton P, Kishen T, and Diwan A. Geometrical & Interfacial Modulation of a Biomimetic Spinal Implant. Journal of Biomimetics, Biomaterials and Tissue Engineering 2009; 4: 41-58. Lloyd BD, Williamson DA, Singh NA, Hansen RD, Diamond TH, Finnegan TP, Allen BJ, Grady JN, Stavrinos TM, Smith EU, Diwan AD, and Fiatarone Singh MA. Recurrent and injurious falls in the year following hip fracture: a prospective study of incidence and risk factors from the Sarcopenia and Hip Fracture study. J Gerontol A Biol Sci Med Sci. 2009; 64: 599-609. Fiatarone Singh MA, Singh NA, Hansen RD, Finnegan TP, Allen BJ, Diamond TH, Diwan AD, Lloyd BD, Williamson DA, Smith EU, Grady JN, Stavrinos TM, and Thompson MW. Methodology and baseline characteristics for the Sarcopenia and Hip Fracture study: a 5-year prospective study. J Gerontol A Biol Sci Med Sci. 2009; 64: 568-74. Tao H, Shen B, Wei A, Kishen T, Diwan A, and Ma DD. Therapeutic potential of bone marrow-derived mesenchymal stem cells to repair degenerative intervertebral discs. Journal of stem cells. 2008; 3: 1-11. Lu J, Bhargav D, Wei A, and Diwan AD. Posterolateral inter-transverse spinal fusion possible in osteoporotic rats with BMP-7 in a higher dose delivered on a composite carrier. Spine. 2008; 33: 242-249. Tassabehji M, Fang ZM, Hilton EN, McGaughran J, Zhao Z, de Bock CE, Howard E, Malass M, Donnai D, Diwan A, Manson FD, Murrell D, and Clarke RA. Mutations in GDF6 are associated with vertebral segmentation defects in Klippel-Feil syndrome. Hum Mutat. 2008; 29: 1017-1027. Brisby H, Wei A, Chung S, Tao H, Ma D, and Diwan A. Survival and differentiation of syngeneic bone marrow-derived mononuclear cells in rat intervertebral discs. . Journal of stem cells. 2008; 3: 165-172. Williams LA, Bhargav D, and Diwan AD. Unveiling the BMP13 enigma: redundant morphogen or crucial regulator? Int J Biol Sci. 2008; 4: 318-29. Chung SA, Wei AQ, Connor DE, Webb GC, Molloy T, Pajic M, and Diwan AD. Nucleus pulposus cellular longevity by telomerase gene therapy. Spine. 2007; 32: 1188-96. Wei A, Brisby H, Chung SA, and Diwan AD. Bone morphogenetic protein-7 protects human intervertebral disc cells in vitro from apoptosis. The Spine Journal. 2007; 8: 466-74. Brisby H, Ashley H, and Diwan AD. In vivo measurement of facet joint nitric oxide in patients with chronic low back pain. Spine. 2007; 32: 1488-92. Hansen RD, Williamson DA, Finnegan TP, Lloyd BD, Grady JN, Diamond TH, Smith EU, Stavrinos TM, Thompson MW, Gwinn TH, Allen BJ, Smerdely PI, Diwan AD, Singh NA, and Singh MA. Estimation of thigh muscle cross-sectional area by dual-energy X-ray absorptiometry in frail elderly patients. Am J Clin Nutr. 2007; 86: 952-8. Kulkarni AG, Sabet T, Ashley H, and Diwan AD. Technical note: the swimmer's view for cervical facet joint injections. Eur Spine J. 2006; 15: 1150-2. Baldik Y, Diwan AD, Appleyard RC, Fang ZM, Wang Y, and Murrell GA. Deletion of iNOS gene impairs mouse fracture healing. Bone. 2005; 37: 32-6. Kulkarni AG and Diwan AD. Prosthetic lumbar disc replacement for degenerative disc disease. Neurol India. 2005; 53: 499-505. Khan SN, Cammisa FP, Jr., Sandhu HS, Diwan AD, Girardi FP, and Lane JM. The biology of bone grafting. J Am Acad Orthop Surg. 2005; 13: 77-86. Ben-Nissan B, Milev A, Vago R, Conway M, and Diwan A. Sol-gel derived nano-coated coralline hydroxyapatite for load bearing applications. Key engineering materials. 2004; 254-256: 301-304. Brisby H, Tao H, Ma DD, and Diwan AD. Cell therapy for disc degeneration--potentials and pitfalls. Orthop Clin North Am. 2004; 35: 85-93. Gorman DJ, Kam PA, Brisby H, and Diwan AD. When is spinal pain "neuropathic"? Orthop Clin North Am. 2004; 35: 73-84. Chung SA, Khan SN, and Diwan AD. The molecular basis of intervertebral disk degeneration. Orthop Clin North Am. 2003; 34: 209-19. Nord RM, Sandhu HS, Khan SN, and Diwan AD. Threaded cortical bone dowels in lumbosacral arthrodesis: a review. Clin Orthop Relat Res. 2003: 101-11. Diwan AD, Parvartaneni H, and Cammisa F. Failed degenerative lumbar spine surgery. Orthop Clin North Am. 2003; 34: 309-24. Fraser JF, Diwan AD, Peterson M, O'Brien MF, Mintz DN, Khan SN, and Sandhu HS. Preoperative magnetic resonance imaging screening for a surgical decision regarding the approach for anterior spine fusion at the cervicothoracic junction. Spine. 2002; 27: 675-81. Sandhu HS, Toth JM, Diwan AD, Seim HB, 3rd, Kanim LE, Kabo JM, and Turner AS. Histologic evaluation of the efficacy of rhBMP-2 compared with autograft bone in sheep spinal anterior interbody fusion. Spine. 2002; 27: 567-75. Diwan AD, Parvataneni HK, Khan SN, Sandhu HS, and Cammisa FP, Jr., Revision Surgery for failed lumbar spine surgery for degeneration. The Failed Back, ed. S. Boden. 2002: Lippincott. 203-219. Mariotti AJ and Diwan AD. Current concepts in anterior surgery for thoracolumbar trauma. Orthop Clin North Am. 2002; 33: 403-12, vii. Zhu W, Murrell GA, Lin J, Gardiner EM, and Diwan AD. Localization of nitric oxide synthases during fracture healing. J Bone Miner Res. 2002; 17: 1470-7. Namkung-Matthai H, Appleyard R, Jansen J, Hao Lin J, Maastricht S, Swain M, Mason RS, Murrell GA, Diwan AD, and Diamond T. Osteoporosis influences the early period of fracture healing in a rat osteoporotic model. Bone. 2001; 28: 80-6. Zhu W, Diwan AD, Lin JH, and Murrell GA. Nitric oxide synthase isoforms during fracture healing. J Bone Miner Res. 2001; 16: 535-40. Lin JH, Wang MX, Wei A, Zhu W, Diwan AD, and Murrell GA. Temporal expression of nitric oxide synthase isoforms in healing Achilles tendon. J Orthop Res. 2001; 19: 136-42. Namkung-Matthai H, Diwan A, Mason RS, Murrell GA, and Diamond T. Nitric oxide regulates alkaline phosphatase activity in rat fracture callus explant cultures. Redox Rep. 2000; 5: 126-7. Khan SN, Hidaka C, Sandhu HS, Girardi FP, Cammisa FP, Jr., and Diwan AD. Gene therapy for spine fusion. Orthop Clin North Am. 2000; 31: 473-84. Diwan AD, Parvataneni HK, Khan SN, Sandhu HS, Girardi FP, and Cammisa FP, Jr. Current concepts in intervertebral disc restoration. Orthop Clin North Am. 2000; 31: 453-64. Diwan AD, Wang MX, Jang D, Zhu W, and Murrell GA. Nitric oxide modulates fracture healing. J Bone Miner Res. 2000; 15: 342-51. Lane JM, Diwan AD, and Khan SN. Osteoporosis: current clinical trends Clinical Geriatrics. 2000; 8: 27-39. Diamond T and Diwan AD. Osteoporotic fracture healing. APLAR Journal of Rheumatology. 1999; 2: 254-259. Clarke RA, Catalan G, Diwan A, and Kearsley JH. Heterogeneity in Klippel-Feil Syndrome: a new classification. Paediatric Radiology. 1998; 28: 967-74. Diwan AD, Yi DH, Wang M, Jang D, Smythe G, and Murrell GAC. Serum Nitrate in Fracture repair. Nitric Oxide Biology and Chemistry (Archives of Biochemistry and Biophysics, part B). 1998; 2: 134. Diwan A, Diamond T, Clarke R, Patel MK, Murrell GA, and Sekel R. Familial slipped capital femoral epiphysis: a report and considerations in management. Aust N Z J Surg. 1998; 68: 647-9. Clarke R, Kovacic A, Fang ZM, Yip MY, D W, A M, and Diwan AD. The SGM1 gene and genetic heterogeneity in Klippel-Feil Syndrome. The journal of bone and joint surgery. 1998; 80B: 112. Diwan AD and Drummond RD. Unusual cause of third body wear in total hip replacement - a case report. Journal of Arthroplasty. 1997; 12: 586-588. Sancheti KH, Ghandi MA, and Diwan AD. Panarticular adhesiolysis of stiff elbow joint by a single posterior incision. Indian journal of orthopaedics. 1994; 28: 52-55. Natrajan A, Kotwal PP, Diwan AD, and Dave PK. treatment of tibial fractures by pulsed electromagnetic field technique. Journal of western pacific orthopaedic association. 1991; 28. Siddiqui HD, Raza HKT, and Diwan AD. Results of surgery for fractures of the lateral humeral condyle in children. Clinical orthopaedics India. 1989; 3: 10-15. Diwan AD, Raza HKT, and Siddiqui HD. A study of congenital limb deficiencies in Seoni and Jabalpur. Journal of Madhya Pradesh chapter of Indian Orthopaedic association. 1988; 3: 1-5. Mohapatra B, Kishen TJ, Sandhu S, Etherington G, Diwan AD. Iatrogenic Spinal Cord Injury: Incidence, Prevention and Management. Pg 518-530 In: Spinal Infections and Trauma. 2011. Ed. Rajasekaran S. Jaypee Brothers Medical Publishers. New Delhi. India. Priyadarshi H, Kishen TJ, Etherington G, Diwan AD. Flexion Distraction Injuries and Fracture Dislocations of the Thoracolumbar Spine. Pg. 471-480 In: Spinal Infections and Trauma. 2011. Ed. Rajasekaran S. Jaypee Brothers Medical Publishers. New Delhi. India. Diwan A.D., Parvataneni H.K., Khan, S.N., Sandhu H., Cammisa F.P. Revision surgery for failed lumbar spine surgery for degeneration. In “The Failed Back” Editor Scott Boden. Lippincott. – Lumbar Spine – Degenerative Disease pages 203-219 December 2002. Tom Hodgkinson1*, Aiqun Wei2*, Bojiang Shen2, Wur3, Lisa Williams2, Walter Sebald3, Ashish Diwan2, Stephen M. Richardson1, Judith A. Hoyland1 1University of Manchester, UK. 2St George Clinical School, University of New South Wales, Sydney, Australia 3University of Wurzburg, Germany. Growth differentiation factor 6 signaling promotes a non-degenerate phenotype and increases proteoglycan production in human nucleus pulposus cells through smad and smad-independent signaling pathways. ORS 2017, 19-22 March 2017, San Diego, CA, USA – Poster. ORS Spine Section Best Paper Award. Tom Hodgkinson1*, Aiqun Wei2*, Bojiang Shen2, Wur3, Lisa Williams2, Walter Sebald3, Ashish Diwan2, Stephen M. Richardson1, Judith A. Hoyland1 1University of Manchester, UK. 2St George Clinical School, University of New South Wales, Sydney, Australia 3University of Wurzburg, Germany. Growth differentiation factor 6 signaling promotes a non-degenerate phenotype and increases proteoglycan production in human nucleus pulposus cells through smad and smad-independent signaling pathways. ORS 2017. Society for Back Pain Research, 2-3 Nov 2017, Northampton, UK – poster. Ramakrishna V, Chamoli U, Tsafnat N, Diwan AD. The role of sacral slope in the progression of bilateral spondylolytic defect at L5 to spondylolisthesis: A biomechanical Investigation using Finite Element Analysis. Proceedings of the St George Medical Symposium, 13 Oct 2016, Sydney. nfluencesbending stiffness of the human lumbar motion segment: A finite element modeling study. Proceedings of the St George Medical Symposium, 13 Oct 2016, Sydney. Chamoli U, Tsafnat N, Diwan AD. Trade-off between restoring stability and endplate stresses in the lumbar spine using different volume grades of a nucleus arthroplasty system: A finite element study. International Society for Study of Lumbar Spine (ISSLS SpineWeek 2016). May 16-20, 2016, Singapore. Chamoli U, Tsafnat N, Diwan AD. Biomechanical evaluation of a bilateral spondylolytic defect at L5 and its progression into two clinically observed spondylolisthesis patterns: A finite element study. International Society for Study of Lumbar Spine (ISSLS SpineWeek 2016). May 16-20, 2016, Singapore. Chamoli U, Korkusuz MH, Diwan AD. The importance of posterior osteoligamentous structures to lumbar spine stability and new perspectives on spinal motion metrics. Spine Society of Australia annual scientific meeting. April 10-12, 2015, Canberra. Diwan A, Chamoli U, Tsafnat N. Biomechanical analysis of a bilateral spondylolytic defect at L5 and its progression into two clinically observed spondylolisthesis patterns: A finite element study. ORS – Philadelphia Spine Research Society 3rd International Spine Research Symposium, November 9-12, 2015, Philadelphia. Sabnis A, Chamoli U, Diwan AD; Is L5-S1 Motion Segment Different from that Rest? – A Radiological Kinematic Study of 84 Patients with Chronic Back Pain. Podium Presentation Proceedings of the 14th Annual Scientific Meeting of International Society for the Advancement of Spinal Surgery; Miami FL Apr 30-May2 2014. Zhu F, Wei AQ, Diwan AD; In vitro Assessment of the Proliferative and Chemotactic Potential of BMP-13 on a Chondrocyte Cell Line. Oral Poster Presentation Proceedings of the 14th Annual Scientific Meeting of International Society for the Advancement of Spinal Surgery; Miami FL Apr 30-May2 2014. Zhu F, Wei AQ, Diwan AD; In vitro Assessment of the Proliferative and Chemotactic Potential of BMP-13 on a Chondrocyte Cell Line. Podium Presentation Proceedings of the Annual Adelaide Spinal research Centre Symposium – August 2013. Wei A, Pathmanandavel S, Williams L, Bhargav S, Diwan AD; Expression of BMP-13 in the developing Human Spine. Annual Scientific Meeting of the Orthopaedic Research Society; San Antonio Feb. 2013. Kishen TJ, Wei A, Williams LA, Bhargav D, Shen B, Duffy N, Diwan AD. BMP13 prevents degenerative effects of annular injury in an ovine model (Best Presentation Award Finalist). Proceedings of the Annual Scientific Meeting NeuroSpine 9-11 September 2011, Bangalore, India. Chung S, Diwan AD: Migration of human endplate, annulus and nucleus pulposus cells in vitro. ACSR Spinal Research Symposium VIII, Adelaide, 10-12 August 2010. Wei A, Pathmanandavel S, Williams LA, Bhargav D, Gulati T, Shen B, Kishen T, Fang Z, Clarke RA, Diwan AD: Immunolocalization of human bone morphogenetic protein 13 in the developing human spine. ISSLS Annual Meeting, Auckland, New Zealand, 13-17 April 2010. Wei A, Williams LA, Bhargav D, Shen B, Kishen T, Duffy N, Diwan AD. BMP13 prevents the effects of annular injury in an ovine model. AAOS Annual Meeting, New Orleans, 10-13 March 2010. Wei, H. Brisby, T. Molloy, S. A. Chung, G. Murrell, Diwan AD. The Effects of Running on Intervertebral Disc Extracellular Matrix Production in Rats. North American Spine Society, San Francisco, 11 November 2009. Wei, H. Brisby, T. Molloy, S. A. Chung, G. Murrell, Diwan AD: The Effects of Running on Intervertebral Disc Extracellular Matrix Production in Rats. Australian Conference of Science and Medicine in Sport, 16 October 2009. Wei, H. Brisby, T. Molloy, S. A. Chung, G. Murrell, Diwan AD: The Effects of Running on Intervertebral Disc Extracellular Matrix Production in Rats. Global Spine Congress 2009, San Francisco 24 June 2009. Shen B, Wei A, Whittaker S, Tao H, Ma D, Diwan AD. : The role of BMP-7 in chondrogenic and osteogenic differentiation of human bone marrow multipotent mesenchymal stromal cells in vitro. ISSLS 2009, Miami Beach, 8 May 2009. Garis S, Bloom A, Diwan AD. Financial and Psychosocial impact of low back pain on the individual and household. Spine Society of Australia, 17 April 2009. Fiatarone-Singh M, Singh N. Hansen R, Finnegan T, Allen B, Diamond T, Diwan AD, Lloyd B, Williamson D, Smith E, Grady J, Stavrinos T, Thompson M. Methodology and Baseline Characteristics for the Sarcopenia and Hip Fracture (SHIP) Study: A Five-Year Prospective Study (Abstract). Gerontology 48(11): 54, 2008. Lloyd B, Williamson D, Singh N, Hansen R, Diamond T, Finnegan T, Allen B, Grady J, Stavrinos T, Smith E, Diwan AD, Fiatarone-Singh M. Recurrent and Injurious Falls in the Year Following Hip Fracture: A Prospective Study of Incidence and Risk Factors from the Sarcopenia and Hip Fracture (SHIP) Study. (Abstract). Gerontology 48(11): 54, 2008. Diwan AD: Frontiers in Instrumented Treatment for Painful Disc Degeneration, Are we there? The Next Frontiers in Spine Surgery, August 2008, St Lukes College of Medicine William H Quasha Memorial, Manila. Diwan AD, Allen B, Williamson D, Grady J, Lloyd B, Fiatarone Singh M, Singh N, Hansen R, Smith E, Finnegan T, Diamond T, Stavrinos T: Recurrent and Injurious Falls in the Year Following Hip Fracture: A Prospective Study of Incidence and Risk Factors from the Sarcopenia and Hip Fracture (SHIP) Study. The Gerontological Society of America’s 61st Annual Scientific Meeting, Washington DC, 22-24 November 2008. Williamson , Diwan AD, Allen B, Lloyd B, Smith E, Grady J, Fiatarone Singh M, Thompson M, Singh N, Hansen R, Finnegan T, Diamond T, Stavrinos T: Methodology and Baseline Characteristics for the Sarcopenia and Hip Fracture (SHIP) Study: A One-Year Prospective Study. The Gerontological Society of America’s 61st Annual Scientific Meeting, Washington DC, 22-24 November, 2008. Hsu J, Shen B, Tao H, Ma D, Diwan AD. Bone Marrow mesenchymal stem cells have distinct phenotypic characteristics compared to intervertebral disc cells and may be differentiated towards intervertebral disc cells via co-culture. ISSLS Annual General Meeting, Geneva, Switzerland 26-31 May 2008. (Best Poster Presentation Award Diwan AD). Sabet T, Diwan A D: Lumbar Total Disc Replacement and Non-Operative Care: A longitudinal Comparison of Two Cohorts with a minimum Follow-Up of Two-Years. Podium presentation Spine Society of Australia Annual Scientific Meeting, Adelaide 17-20 April 2008. Shen B, Wei A, Tao H, Ma D, Diwan AD. BMP2 Enhances TGFβ3 mediated differentiation of Human Bone Marrow Mesenchymal Stem Cells in Alginate Bead Cultures. Inaugural Annual Stem Cell Symposium at UNSW, Sydney, Australia, 6th August, 2007. Ho R, Sabet TS, Cake M, Little C, Diwan AD, Kishen T, Ho V, Appleyard R: Changes in lumbar disc kinematics via hormonal withdrawal and replacement; an ovine model. IITS Toulouse France June 2007. Sabet T, Ho R, Choi J, Diwan AD. Kinematics of the Motion Segment are restored using a novel nuclear replacement device – a comparative study using kangaroo spine model (Lyman Smith MD Award) IITS Toulouse France June 2007. Fisher S, Kishen T, Diwan AD: Can the compressive oral characteristics of a lumbar disc be restored? – a feasibility study (Lyman Smith MD Award) IITS Toulouse France June 2007. Sabet T, Kishen T, Diwan AD. Early and sustainable improvements in pain are evident as soon as ten days after lumbar total disc replacement – a minimum follow up of two years. IITS Toulouse France June 2007. Chung SA, Wei AQ + Connor DE, Molloy T, Pajic M, Diwan AD. Cellular longevity of the Intervertebral Disc. IITS Toulouse France June 2007. Fisher, S, Kishen T, Diwan AD: Can the compressive local characteristics of a lumbar disc be restored? Spine Society of Australia Hobart April 2007. SAS7 Berlin May 2007. Sabet T, Ho R, Choi J, Diwan AD. Kinematics of the Motion Segment are restored using a novel nuclear replacement device – a comparative study using kangaroo spine model. SAS7 Berlin May 2007. Ho R, Sabet TS, Cake M, Little C, Diwan AD, Kishen T, Ho V, Appleyard R. Changes in lumbar disc kinematics via hormonal withdrawal and replacement; an ovine model. SAS7 Berlin May 2007. Sabet TS, Kishen T, Diwan AD: Clinical outcomes following lumbar disc total disc replacement – a minimum follow up of two years. Spine Society of Australia Hobart April 2007. Sabet TS, Kishen T, Diwan AD: A novel nuclear replacement device – a comparative study of kinematic behaviour utilising a kangaroo spine model. Spine Society of Australia Hobart 2007. Fisher S, Kishen T, Diwan AD: Can the compressive oral characteristics of a lumbar disc be restored? – a feasibility study. Spine Society of Australia Hobart 2007. Wei A, Chung S, Tao H, Brisby H, Lin Z, Ma D, Diwan AD: Differentiation of bone marrow-derived mesenchymal stem cells into disc like cells after co-culture with rat disc explants. Spine Society of Australia Hobart 2007. Ho R, Sabet T, Cake M, Little C, Kishen T, Diwan AD, Ho V, Appleyard R: Effects of ovarectomy & hormone replacement on the kinematics of the intervertebral disc on ovine model. Spine Society of Australia Hobart 2007. Sabet TS, Bhargav D, Diwan AD: Lumbar motor beliefs correlate with functional disability in patients with mechanical chronic low back pain. ISSLS Hong Kong June 2007. Wei A, Chung S, Tao H, Brisby H, Lin Z, Ma D, Diwan A: Differentiation of bone marrow-derived mesenchymal stem cells into disc-like cells after co-culture with rat disc explants. Spine Society of Australia Hobart April 2007. ISSLS Hong Kong June 2007. Lu J, Wei A, Bhargav D, Diwan A: Effects of osteogenic protein 1 on lumbar posterolateral intertransverse fusion model in osteoporotic animals. ISSLS Hong Kong June 2007. Ho R, Sabet T, Cake M, Little C, Kishen T, Diwan AD, Ho V, Appleyard R: Effects of ovarectomy & hormone replacement on the kinematics of the intervertebral disc on ovine model. Spine Society of Australia Hobart April 2007. SAS7 Berlin May 2007. ISSLS Hong Kong June 2007. Shen B, Wei A, Tao H, Diwan AD Ma D: BMP-2 acts synergistically with TGF-B3 to differentiate human bone marrow mesenchymal stem cell into nucleus pulposus cells: 53rd Annual Meeting of the Orthopaedic Research Society, San Diego, February 2007. Shen B, Wei A, Tao H, Diwan AD Ma D: Differentiation of human bone marrow mesenchymal stem cells towards nucleus pulposus cells induced by combination of TGF-B3 & BMP2 in 3D culture. 5th ISSCR Annual Meeting Cairns, Australia, June 2007. Fiatrone-Sing M, Thompson M, Gwinn T, Allen B, Singh N, Finnegan T, Smerdely P, Diamond T, Diwan AD, Hansen R, Grady J, Williamson D, Stavrinos T, Lloyd B, Smith E, Ghobrial M: SHIP (Sarcopenia and Hip Fracture Study): A Prospective Study of the Etiology of Falls and Injuries in the Year Following Hip Fracture. 59th Annual Scientific Meeting of the Gerontological Society of America, Dallas, 16-20 November 2006. Wei A, Chung SA, Brisby H, Diwan AD. Bone Morphogenic Protein rescues human Intervertebral Disc cells in-vitro from apoptosis. ISSLS Bergen, Norway. June 2006. Best Poster Presentation Award. Chung SA, Wei AQ + Connor DE, Molloy T, Pajic M, Diwan AD. Cellular longevity of the Intervertebral Disc. ISSLS Bergen, Norway, June 2006. Chung SA, Wei AQ + Connor DE, Molloy T, Pajic M, Diwan AD. Cellular longevity of the Intervertebral Disc. SAS6 Montreal, Canada, May 2006. Wei A, Chung SA, Brisby H, Diwan AD. Bone Morphogenic Protein rescues human Intervertebral Disc cells in-vitro from apoptosis. SAS6 Montreal, Canada, May 2006. Wei A, Chung SA, Brisby H, Diwan AD. Bone Morphogenic Protein rescues human Intervertebral Disc cells in-vitro from apoptosis. Spine Society of Australia, Sydney, April 2006. Medtronics Best Paper Award. Lu J, Wei AQ, Bhargav D, Diwan AD. Effects of OP-1 Device on a Posterolateral Inter-Transverse Spinal Fusion Model in Osteoporotic Rats. Spine Society of Australia, Sydney, April 2006 (Medtronics Best Paper Award). Chung SA, Wei AQ + Connor DE, Molloy T, Pajic M, Diwan AD. Cellular longevity of the Intervertebral Disc. Orthopaedic Research Society, Chicago, March 2006. Wei AQ, Tao H, Brisby H, Chung S, Ma D, Diwan AD. The Fate of Transplanted Xenogeneic Bone Marrow-Derived Stem Cells in Rat Intervertebral Discs. Orthopaedic Research Society, Chicago, March 2006. Fiatrone-Sing M, Diwan AD: Sarcopenia and poor nutrition predict disability one year after hip fracture in older adults. Proceedings of the 58th Annual Meeting of the Gerentological Society of America – New Orleans, 18-22 November 2005. Fisher S, Gilles M, Diwan AD: A Finite Element Analysis model of intervertebral disc (Finalist Basic Sciences) – Proceedings of the Annual St George Hospital Symposium – 8 November 2005. Chung S, Wei A, Diwan AD: Disc Senescence can be reversed (Finalist Basic Sciences) - Proceedings of the Annual St George Hospital Symposium – 8 November 2005. Wei A, Chung S, Brisby H, Tao H, Ma D, Diwan AD: CD34-Cells differentiate in the intervertebral disc - Proceedings of the Annual St George Hospital Symposium – 8 November 2005. Ashley H, Diwan AD: Temporal outcomes of total disc replacement of degenerative lumbar spine (Finalist, Clinical Sciences) - Proceedings of the Annual St George Hospital Symposium – 8 November 2005. Wei A, Tao H, Brisby H, Diwan AD and Ma DDF (2005) Human bone marrow CD34+haemopoietic stem cells failed to differentiate in rat intervertebral discs. ESH-EBMT-EUROCORD Euroconference on Stem Cell Research. Abstract 50. Leong A, Appleyard R, Diwan AD: OP-1 enhances osteoporotic fracture healing – a study in rat femoral. Proceedings of Annual Scientific meeting of the Australian Orthopaedic Registrar Association – Leura NSW – November 2003. Proceedings of the Annual St George Hospital Symposium – 8 November 2005. Diwan AD: Unilateral mechanical and contralateral biological stabilisation – a novel Posterior Spinal Fusion technique - Proceedings of the Annual St George Hospital Symposium – 8 November 2005. Chung S, Diwan AD: Disc senescence can be reversed - Proceedings of the Annual St George Hospital Symposium – 8 November 2005. Wei A, Tao H, Brisby H, Chung S, Ma DDF and Diwan AD (2005): The fate of transplanted syngeneic and xenogeneic bone marrow derived stem cells in rat intervertebral discs. 3rd Annual Meeting of International Society for Stem Cell Research Abstract 654. Brisby H, Ashley H, Diwan AD: Nitric oxide is expressed in perifacetal area of patients with chronic back pain – a study comparing asymptomatic controls – Proceeding of V Spine Arthroplasty Society, New York – May 2005. Brisby H, Wei A, Chung S, Tao H, Ma DDF and Diwan AD: Survival and differentiation of syngeneic bone marrow-derived mononuclear cells in rat intervertebral discs. Annual Proceedings of the Spine Society of Australia, Auckland April 2005. Finalist – Medtronics Best Research Paper Award. Brisby H, Ashley H, Diwan AD: Nitric oxide is expressed in perifacetal area of patients with chronic back pain – a study comparing asymptomatic controls – Annual Proceeding of the Spine Society of Australia – Auckland April 2005. Orthotech Best Paper Award. Leong AK; Appleyard, R: Fang, J; Baldik Y; Lu, Z: Turnbull, Diwan AD The effects of BMP-7 Collagen 1 Composite (Osteogenic Protein-1 Device) on Osteoporotic Fracture Healing in Rats - Orthopaedic Research Society Transactions Vol 30, Washington D.C. 2005. Brisby, H; Ashley, H, Diwan AD: Facet Joint Nitric Oxide Production in Patients with Chronic Low Back Pain – Orthopaedic Research Society Transactions Vol. 30, Washington, D.C., 2005. Brisby H, Wei A, Chung S, TaoH, Ma DDF and Diwan AD: Survival and differentiation of syngeneic bone marrow-derived mononuclear cells in rat intervertebral discs. 2nd Australian National Stem Cell Centre Conference. Abstract 1110. 22-24 November 2004. Diwan A.D., Ashley H.: Early outcomes of total disc replacement – a longitudinal cohort study. Proceedings of the Annual Scientific meeting of Asia Pacific Orthopaedic Association – Kuala Lumpar September 2004. Diwan AD: BMP – Issues and current status. Proceedings of 5th Orthopacific Annual Scientific meeting – Queenstown (NZ) July 2004. Brisby H, Wei A, Chung S, TaoH, Ma DDF and Diwan AD. (2004) Survival and differentiation of syngeneic bone marrow-derived mononuclear cells in rat intervertebral discs. 2004 Annual Meeting of The International Society for the Study of the Lumbar Spine. Abstract. O’Porto Portugal - Jun 2004. De La Costa R., Swaarnakumar V., Appleyard R., Diwan AD: The kangaroo spine destabilises due to annular tears. Proceedings of Annual Scientific meeting of ISSLS – O’Porto Portugal – May-June 2004. Rajaratnam, R; Low, A; Yu, Y; Fang, J; Janssen, J; Diwan, AD; Walsh, W.R.: The Effects of Long Term Ovariectomy on Fracture Healing in Rats – Orthopaedic Research Society, Transactions Vol. 29, San Francisco, California, 2004. Leong A., Appleyard R., Diwan AD: OP-1 enhances osteoporotic fracture healing – a study in rat femoral. Proceedings of Annual Scientific meeting of the Australian Orthopaedic Registrar Association – Leura, NSW, November 2003. Allan Dwyer Prize. Baldik Y, Diwan AD, Appleyard RC, Fang ZM, Lauric S, Janssen J, Murrell GAC. Enhancement of fracture healing by nitrosalbumin. Proceedings of the 49th Annual Scientific Meeting of the Orthopaedic Research Society, New Orleans, Louisiana, 2-5 February 2003. Khan SN, Fraser J, Abjornson C, Atti E, Doty SB, Sandhu HS, Cammisa Jr FP, Lane JM, Diwan AD. Inhibition of nitric oxide synthase arrests chondrocyte maturation and promotes collagen type X synthesis. A zonal analysis in rat tibial epiphyseal plates. Proceedings of the 49th Annual Scientific Meeting of the Orthopaedic Research Society, New Orleans, Louisiana, 2-5 February 2003. Diwan AD, Khan SN, Campbell D, Peterkin M, Sandhu HS, Cammisa Jr FP, Doty SB, Lane JM. Nitric oxide modulates rhBMP-2 induced corticocancellous autograft incorporation in rat intertransverse process fusion. Proceedings of the 49th Annual Scientific Meeting of the Orthopaedic Research Society, New Orleans, Louisiana, 2-5 February 2003. Diwan AD, Boachie-Adjei O, Rawlins BA. Long term clinical outcome of treatment for adult flatback deformity. Proceeding of 35th Annual scientific meeting of Scoliosis Research Society, Cairns QLD Australia, 17-21 Oct 2000. Zhu W, Marriotti A, Murrell G.A.C., Diwan AD; Nitric oxide synthases gene therapy; a study in a novel explant callus culture. Proceedings of 12th Annual Meeting of ANZ Bone Mineral Society, Adelaide, 6th -9th Oct 2002. Diwan AD, Khan S., Sandhu H., Fraser J., Cammisa F., Lane J., Doty S., Campbell D., Myers E.,: Nitric oxide modulates rhBMP2 induced corticocancellousautograft incorporation: a study in rat intertransverse fusion Proceedings of 37th Meeting of Scoliosis Research Society; Seattle (W), 17-21 Sept 2002. Diwan AD., Khan S., Sandhu H., Fraser J., Cammisa F., Lane J., Doty S., Campbell D., Myers E.,: Nitric oxide modulates rhBMP2 induced corticocancellousautograft incorporation: a study in rat intertransverse fusion Proceedings of 69th American Academy of Orthopaedic Surgeons, Dallas (Tx) 6th – 10th Feb 2002. Zhu W, Marriotti A, Murrell G.A.C., Diwan AD; Nitric oxide synthases gene therapy; a study in a novel explant callus culture. Proceeding of the 48th Annual Meeting of the Orthopaedic Research Society Dallas Tx 2nd-5th Feb 2002. Diwan AD. Bone graft substitutes in spinal surgery proceedings of the 3rd Annual Stryker Spinal Meeting Noosa (QLD) 31st May – 2nd June 2002. Diwan AD. Spinal interbody fusion can be performed without bonegraft proceedings of the 3rd Annual Stryker Spinal Meeting Noosa (QLD) 31st May – 2nd June 2002. Diwan AD, Khan S., Sandhu H., Fraser J., Cammisa F., Lane J., Doty S., Campbell D., Myers E.,: Nitric oxide modulates rhBMP2 induced corticocancellousautograft incorporation: a study in rat intertransverse fusion Proceedings of Eurospine 2001 Gothenburgh Sweden 5-8 Sept 2001. Fraser J, Diwan AD, Sandhu HS, Khan SN, Mintz D, Peterson M.: MRI and preoperative screening for surgical approach in anterior spinal fusion of the cervicothoracic junction. Proceedings of Eurospine 2001 Gothenburgh Sweden 5-8 Sept 2001. Diwan, AD, Sandhu H.S., Kanim L.E.A., Toth J., Seim H., Kabo J., Turner S. Histological evaluation of the efficacy of rhBMP2 when compared to autograft bone in sheep spinal interbody fusion using titanium cage. Proceedings of the 68th Annual Meeting of the American Academy of Orthopaedic Surgeons San Francisco (CA) 28Feb-4 Mar 2001. Zhu W, Diwan AD, Lin J, Murrell G A C.: Identification and localization of nitric oxide synthase isoforms in various stages of fracture healing. . Proceedings of the 47th Annual Meeting of the Orthopaedic Research Society San Francisco (CA) 24-28Feb 2001. Zhu W, Diwan AD, Lin J, Murrell G A C.: Identification and localization of nitric oxide synthase isoforms in various stages of fracture healing. . Proceedings of the 68th Annual Meeting of the American Academy of Orthopaedic Surgeons San Francisco (CA) 28Feb-4 Mar 2001. Matthai H N, Appleyard R, Jenson J, Lin J H, Maastricht S, Swain M, Mason R, Murrell G, Diwan AD, Diamond T: Osteoporosis influences the early period of fracture healing in a rat osteoporotic model. Proceedings of the ANZ Bone and Mineral Society, Cairns, Australia, 1-4 Nov.
Diwan AD. : Nitric oxide modulates rhBMP-2 induced corticocancellous autograft incorporation in rat intertransverse fusion. Annual proceedings of the National Orthopaedic Surgery Fellows Foundation, Jacksonville (FL), 4-6 Nov 2000. Diwan AD, Sandhu H.S., Kanim L.E.A., Toth J., Seim H., Kabo J., Turner S. Histological evaluation of the efficacy of rhBMP2 when compared to autograft bone in sheep spinal interbody fusion using titanium cage. Proceedings of the Annual Scientific Meeting of the HSS Alumni (Philip D Wilson Oration). New York, NY, 2-4 Nov 2000. Diwan AD, Sandhu H.S., Kanim L.E.A., Toth J., Seim H., Kabo J., Turner S. Histological evaluation of the efficacy of rhBMP2 when compared to autograft bone in sheep spinal interbody fusion using titanium cage. 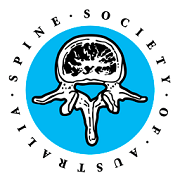 Proceedings of the Annual Meeting of the North American Spine Society, New Orleans 24 – 28 October 2000. Diwan AD, Sandhu H.S., Kanim L.E.A., Toth J., Seim H., Kabo J., Turner S. Histological evaluation of the efficacy of rhBMP2 when compared to autograft bone in sheep spinal interbody fusion using titanium cage. Proceedings of the 27th Annual Meeting of the International Society for the Study of Lumbar Spine (ISSLS), Adelaide, SA Australia, 9-13 April 2000. Diwan, AD, Murrell G.A.C. Nitric oxide enhances fracture repair in rats. Proceedings of the 67th Annual meeting of the American Academy of Orthopaedic Surgeons, Orlando, FL, 15-19 March 2000. Lin J.H., Zhu W., Diwan AD., Murrell G.A.C. Temporal expression of nitric oxide synthase isoforms in rat tendon healing. Proceedings of the Orthopaedic Research Society, Orlando, Fl, 11-15 March 2000. Diwan AD. Nitric oxide can modulate spinal fusion. Proceedings of 5th annual spine, science and management program, New Orleans, LO, 17-19 November 1999. Diwan AD., Wang M., Jang D., Szomor Z., Murrell G.A.C. Nitric Oxide can enhance fracture repair in athletes. Proceedings of the 5th International Olympic Committee World Congress on Sport Sciences, Sydney, NSW, 31 Oct - 5 November 1999. Diwan AD., Wang M., Murrell G.A.C. Fracture healing is modulated by nitric oxide. Proceedings of 1999 Annual Meeting of the Orthopaedic Trauma Association, Charlotte, North Carolina, 22-24 October 1999. Diwan AD., Wang M., Jang D., Murrell G.A.C. Nitric oxide modulates fracture healing. 21st Annual Meeting of the American Society for Bone and Mineral Research, St. Louis, MO, 30 Sep-4 October 1999. Namkung-Matthai, H., Diwan AD., Mason, R.S., Murrell, G.A.C., Diamond T. Nitric oxide regulates alkaline phosphatase activity in fracture healing – a study in a rat fracture callus explant culture system. 21st Annual meeting of the American Society for Bone and Mineral Research, St. Louis, MO, 30 September-4 October 1999. Diwan AD., Namkung-Matthai, H., Zhu, W., Murrell, G., Diamond T. Nitric oxide modulates fracture healing. 6th International Meeting on the Biology of Nitric Oxide, Stockholm, 5-8 September 1999. Namkung-Matthai, H., Diwan AD., Mason, R.S., Murrell, G., Diamond T. Nitric oxide regulates alkaline phosphatase activity in fracture healing – a study in a rat fracture callus explant culture system. 9th Annual Scientific Meeting of Australian and New Zealand Bone and Mineral Society, Cairns 30 June – 2 July 1999. Namkung-Matthai, H., Diwan A.D., Mason, R.S., Murrell, G., Diamond T. Nitric oxide regulates alkaline phosphatase activity in fracture healing – a study in a rat fracture callus explant culture system. Australian Society of Medical Research, Annual Meeting, June 1999. Diwan A.D., Wang M., Jang D., Murrell G.A.C. Modulation of fracture healing by nitric oxide. Proceedings of 8th World Congress SIROT, Sydney, April 1999. Diwan A.D., Wang M., Wei A.Q., Murrell G.A.C. Nitric oxide is present during fracture repair and modulates fracture repair in rats. Proceedings of 8th World congress SICOT, Sydney, April 1999. Diwan A.D., Wang M., Jang D., Szomor Z., Murrell G.A.C. Nitric oxide is present in and modulates fracture repair. Proceedings of the American Academy of Orthopaedic Surgeons, Anaheim, CA, 4-8 February 1999. Diwan A.D., Wang M.X., Jang D., Smythe G., Jensen J., Swain M., Murrell G.A.C. Modulation of fracture healing by nitric oxide. Transactions of Orthopaedic Research Society, Anaheim, CA, 4-7 February 1999. Diwan A.D. Does Nobel’s molecule orchestrate wound healing? Proceedings of the Annual Scientific Meeting of Australian Wound Care Association. Concord Hospital Sydney, 28 November 1998. Diwan A.D, Wang M., Wei A., Jansenn J, Murrell G.A.C. Nitric oxide modulates fracture healing. St George Annual Medical Symposium, 22-23 November 1998. (Runner up - Young Investigator award). Diwan A.D., Wang M., Jang D., Murrell G.A.C. Does nitric oxide have a role in fracture healing. Proceedings of 8th Annual Scientific Meeting of A & NZ Bone and Mineral Society. Perth 26 -28 August, 1998. Diwan A.D., Yi D.H., Wang M., Jang D., Smythe G., Murrell G.A.C. Serum nitrate in fracture repair. Second Nitric Oxide Conference, UCLA, 11-15 July, 1998. Diwan A.D. Gene therapy - emerging frontiers in orthopaedic surgery. Proceedings of Arthroscopy 2000, Sydney, March 1997. Patel, M., Murrell, G., Diwan A.D. Neuralgic amyotrophy - A shoulder girdle syndrome. Proceedings of the 2nd Academic Congress, Asian Shoulder Association, Perth, WA, 1996. Patel, M., Murrell, G., Diwan A.D. Blow out injuries of the shoulder in parachutists. Journal of Bone & Joint Surgery, Proceedings, 1997, Vol.79-B (Supp.II). Portek I, Diwan A.D., Kirkham B., Edmonds J. Arthroscopic synovial morphology is not affected by intra-articular marcaine and adrenaline. Proceedings of Annual Rheumatology meeting, Brisbane, May 1997. Clarke R, Diwan A.D., Kearsley J. Heterogeneity in Klippel Feil syndrome. 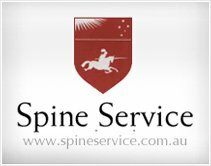 Proceedings of Annual Scientific Meeting of Spine Society of Australia - Queensland, May 1997. Clarke R., Diwan A.D., Fang Z.M., Kearsley J. Genetic heterogenity in familial Klippel Feil syndrome. Proceedings of the combined scientific meeting of the Australian and New Zealand Orthopaedic Associations, Perth, October 1996. Patel M., Diwan A.D., Murrell G.A.C. Blow-out injuries of the shoulder in parachutists. Proceedings of the combined scientific meeting of the Australian and New Zealand Orthopaedic Associations, Perth, October 1996. Woodgate I., Diwan A.D., Sekel R. New technique of removal of ceramic cups and uncemented stems in revision Hip Replacement. Proceedings of the Australian Orthopaedic Registrar Association Conference, Adelaide, July-August 1996. Woodgate I., Diwan A.D., Sekel R.Ceramic on ceramic bearing hip - A review of 157 autophor primary total hip replacements.Proceedings of the Australian Orthopaedic Registrar Association Conference, Adelaide, July-August 1996. Sekel R., Diwan A.D., Annett P., Tan S., Roe J. Ceramic on ceramic total hip replacement - analysis of 156 cases. Proceedings of the Annual Scientific Meeting of the State Branch of Australian Orthopaedic Association. Sydney, November 1995. Diwan A.D. To replace or not to replace - patellar resurfacing in primary total knee replacement. Proceedings of Update in Knee Replacement at Pune Orthopaedic Association meeting - Pune India, 19th June 1995. Diwan A.D. Surgical decision making in rheumatoid arthritis. Proceedings of Update Symposium in Surgery for Rheumatoid’s, Pune, India, June 1993. Diwan A.D. Composites in Orthopaedics. Proceedings of Annual Conference of Indian Society of Composite Materials, Pune, February 1993. Kale S., Diwan A.D.Modified closed femoral nailing. Proceedings of Maharashtra State Orthopaedic Association conference, Pune, India, 1992. Arora R., Diwan A.D.Bone-patellar tendon-bone, for ACL deficient Knees - arthrotomy versus arthroscopic surgery. Proceedings of Maharashtra State Orthopaedic Association conference, Pune, India, 1992. Patil S., Diwan A.D.Closed nailing of forearm bone fractures. Proceedings of Maharashtra State Orthopaedic Association Conference, Pune, India, 1992. Diwan A.D. Percutaneous screw fixation of tibial plateau fractures - a study of 11 cases. Proceedings of Maharshtra State Orthopaedic Association Conference, Pune, India, November 1992. Diwan A.D. Posterior lumbar diskectomies - 93 cases an analysis. Proceedings of the Annual Spine Society Conference, Pune, India, December 1991. Mahajan A., Diwan A.D. Complete calcaneal derotation and release - new technique for CTEV. Proceedings of Maharashtra State Orthopaedic Association Annual Conference, Jalgaon, October 1991. Chandratreya A., Diwan A.D. Limb lengthening by Wagners apparatus - 16 cases”. Proceedings of Maharashtra State Orthopaedic Association Conference, Jalgaon, October 1991. Diwan A.D. Complications of musculoskeletal trauma. Proceedings of National Conference of Emergency Medicine, New Delhi, October 1989. Hasting Memorial Lecture: “Will Gas Make Bone?” – Delivered at St George Hospital Annual Symposium – November 2002. Phillip Wilson Oration: “BMP-2 enhanced spinal fusion” – delivered at the Annual Scientific meeting of the Hospital for Special Surgery Alumni – Cornell University - November 2000. Diwan A.D.: Need for evidence – What is evidence, who needs it and why? ISSLS ICL, Coimbatore, India – 17 January 2008. Diwan A.D.: How to generate evidence in your practice – ISSLS ICL, Coimbatore, India – 17 January 2008. Diwan A.D.: Evidence for Lumbar Disc Replacement – ISSL ICL at ASSICON, Coimbatore, India – 17 January 2008. Diwan A.D.: Does implant selection determine the success of procedure? ISSLS ICL, Coimbatore, India – 18 January 2008. Diwan AD: My experiences with DBM: Grafton Launch by Medtronic Spine Biologics. 20 Oct 2016, Woolloomooloo, Sydney. Diwan AD: Approach to chronic pain of the back - a Medical Model. Multidisciplinary Symposia “We’ve Got Your Back’. 15 Mar 2014 Stamford Hotel Sydney. Diwan AD: Surgery works, but when. Multidisciplinary Symposia “We’ve Got Your Back’. 15 Mar 2014 Stamford Hotel Sydney. Diwan AD: 5 New Things – Neck. Frontiers in Sports Medicine Frontiers in Sports Medicine; Kirk Place 9 Aug 2014. Diwan AD: Debate; Surgery may play a role in Chronic Back Pain Yes (No- Prof IA Harris). 2nd Annual Osteoarthritis Symposium 6 Sept 2014, Novotel Hotel Sydney. Diwan AD: Debate: Is the use of rhBMP2 in spinal Surgery Defensible? Yes (Indefensible – Prof Vin Sandhu Cornell University) 96th Annual Meeting of Hospital for Special Surgery Alumni Association. New York (NY) 30 Oct – 1 Nov 2014. Diwan AD: BMP Use in Spine – Controversies (Scoliosis Session). 96th Annual Meeting of Hospital for Special Surgery Alumni Association. New York (NY) 30 Oct – 1 Nov 2014. Diwan AD: Biological Therapies for Intervertebral Disc Regeneration: Key Note Address to the CG ORTH Con Annual Scientific Meeting 9th to 11 Jan 2011, Raipur (MP), India. Diwan AD: Update on Nucleus Replacement, Faculty, Motion Preservation Special Interest Group – North American Spine Society San Francisco, 10 November 2009. Diwan AD: Spinal Devices. 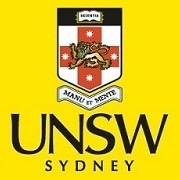 Guest lecture to Biomedical Engineering School of Aerospace, University of Sydney 14 October 2009. Diwan AD: Disc Ablation. Lecture AO Spine, Davos, Switzerland, 19 December 2008. Diwan AD: Deformity Correction in Osteoporosis, AO Spine, Davos, Switzerland, 19 December 2008. Diwan AD: Frontiers in Spinal Research. Presentation to Stryker Technical Development Centre Engineers. Gurgaon, Delhi, 23 September 2008. Diwan AD: Prodisc-C, Prodisc-L, USS II, Synex II. The Next Frontiers in Spine Surgery 2008, St Lukes College of Medicine William H Quasha Memorial, Manila, August 2008. Key Note Speaker Diwan AD: Spine Surgery: Past, Present and Future. The Next Frontiers in Spine Surgery 2008, St Lukes College of Medicine William H Quasha Memorial, Manila, August 2008. Thomas K, Diwan AD: Biologics in Intervertebral Disc Regeneration. World Minimally Invasive Spinal Surgery Congress, Hawaii, June 2008. Diwan AD: The Evidence for Total Disc Replacement – NSW MEDLAW Society April 2008. Diwan AD: What is evidence, who needs it and why. Its role in Lumbar TDR. Prodisc User Group Meeting at the Spine Society of Australia, Adelaide, April 2008. Thomas K, Diwan A.D.: The Status of Total Disc Replacement and Nucleus Replacement in the Asia Pacific Region: APSAS, Seoul, South Korea – 18 January 2008. Key Note Speaker Diwan A.D.: Cervical Total Disc Replacement - How, when, why, then. Proceedings of the Annual Scientific Congress of the Spine Division of Chinese Orthopaedic Assocation Wuhan (Hubei, China) – 14 September 2007. Diwan A.D.: Management of back pain with radiological anomalies. Frontiers in Spine Medicine – August 2007. Key Note Speaker Diwan A.D.: Genetics, telomeres and cellular interactions effecting disc – IITS, Albi, Toulouse, June 2007. Diwan A.D.: Will stem cells cure back pain? Inaugural Stem Cell Workshop of UNSW – August 2007. Diwan A.D.: To fuse or not to fuse degenerative cervical spine – New Delhi, 24-25 June 2006. Key Note Speaker Diwan A.D.: Lumbar Total Disc Replacement Spine Symposia, New Delhi, 24-25 June 2006. Key Note Speaker Diwan A.D.: Biologics and the future in spinal applications, spine symposia, New Delhi, 24-25 June 2006. Diwan A.D.: Molecules and devices – horizons in spinal medicine – Annual meeting of ANZ BMS Sydney Chapter – Kirribilli, 11 July 2006. Key Note Speaker Diwan A.D.: Horizons in biological treatments of disc degeneration – Indian Orthopaedic Association – November, 2006. Key Note Speaker Diwan A.D.: Outcomes of Lumbar Total Disc Replacement. First Spine Arthroplasty Society Symposium in collaboration with Indian Orthopaedic Association – November 2006. Key Note Speaker Diwan A.D.: BMP’s – their present roll in spinal fusion and future in disc degeneration. Perth, 09 December 2005. Key Note Speaker Diwan A.D., Sylvia Chung: Intervertebral Disc Senescence can be avoided – 8th Annual Meeting of the Korean Musculoskeletal Laser and Radiofrequency Society (KOMULARS) Seoul, 8-9 October 2005. Key Note Speaker Diwan A.D.: A minimally invasive novel way to treating vertebral compression fractures using STAXX – 8th Annual Meeting of the Korean Musculoskeletal Laser and Radiofrequency Society (KOMULARS) Seoul, 8-9 October 2005. Key Note Speaker Diwan A.D.: BMP’s – their present roll in spinal fusion and future in disc degeneration. BMP Mini symposium – Adelaide, September 2005. Key Note Speaker Diwan A.D.: Biological interventions in intervertebral disc degeneration – Stryker Spine Symposium, Ayres Rock (NT) 27-29 May 2005. Key Note Speaker Diwan A.D.: Outcomes of Total Disc Replacement – Mumbai, 26-30 December 2005. Diwan A.D.: How to repair a Pars defect – Mumbai, 26-30 December 2005. New Investigator Research Award of the Orthopaedic Research Society – New Orleans – February 2003 – Semi finalist. Philip Wilson award for Best-Fellow’s presentation 2000. Hospital for Special Surgery New York, NY. NOSFF award for “demonstrating exceptional research initiative in musckuloskeletal injury and repair”. Orlando Fl March 2000. Incorporated into “Circle of Excellence” of the Hospital for Speciall Surgery New York, NY. Roger Mellick Award of the ANZ Bone Mineral Society, 2001. Yellow Pages Small Business Awards 2002 – NSW state finalist. Best Paper – AORA – 2004 – Supervisor for Dr Anthony Leong. Best Pre-Clinical Paper – Swedish Orthopaedic Association – August 2004 – Supervisor for Dr Helena Brisby. Finalist – Medtronics Best Research Paper – Spine Society of Australia – Auckland April 2005. Orthotech Best Poster Award – Auckland April 2005. Finalist – Best Basic Research Paper – St George Medical Symposia November 2005. Finalist – Best Clinical Paper – St George Medical Symposia November 2005. Finalist – NIRA (Sylvia Chung) – Orthopaedic Research Society, Chicago – March 2006. Medtronics Best Presentation Award – Spine Society of Australia – Annual Scientific Meeting; Sydney, April 2006. Best Poster Presentation Award – International Society for the Study of the Lumbar Spine (ISSLS) – Annual Scientific Meeting; Bergen (Norway); June 2006. Lyman Smith Award – International Intradiscal Therapy Society (ITTS) – Annual Scientific Meeting, Albi, Toulouse; June 2007. Best Poster Presentation Award – International Society for the Study of the Lumbar Spine (ISSLS) – Annual Scientific Meeting; Geneva (Switzerland); May 2008. Co-author with Tom Hodgkinson who won the ORS Spine Section best poster award ORS 2017, 19-22 March 2017, San Diego, CA, USA – poster.